This organization was created by women for women to celebrate women who embrace life, make a difference in their communities and serve as leaders in their organizations or businesses. The Women Who Embrace Life™ Conference is as a place where women can gather to support other women across the world and encourage each other to improve and grow as a person and a leader in their everyday lives. This conference will feature a Women’s Speed Networking Event and 100’s of Women-Owned Businesses. In addition, the Conference will also feature 30+ Presentations, Panel Discussions, and Workshops. There will also be appearances by a variety of influential women including Darieth Chisolm, Emmy Award-Winning Television Personality, Author, & Visibility Coach; Dr. Shellie Hipsky, CEO/Owner of Inspiring Lives Magazine; and Milena Roucka and Courtney Daylong, Founders of Totally Fit Mama. 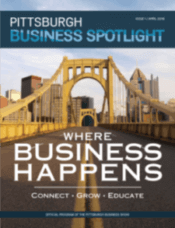 “As a woman-owned business, I thought the Pittsburgh Business Show was the perfect place to hold this conference, providing women in business with the opportunity to network, learn, and make connections with other women business owners in Pittsburgh. The Women Who Embrace Life™ Conference provides women with a supportive space where they can celebrate each other’s amazing accomplishments and help each other grow their businesses. My hope is that this conference brings together all the remarkable women in Pittsburgh and helps them embrace life and make an impact in the Pittsburgh market.” said Linda Jo Thornberg President of Women Who Embrace Life™ and the Pittsburgh Business Show. Join thousands of attendees at the first-ever Women Who Embrace Life™ Conference May 14 and 15, 2019 where you can network with other women-owned business, hear presentations from influential speakers, and participate in panel discussions with experts in their field. Tickets for the Conference can be purchased at three levels: All Access VIP, Just the Basics Admission, and General Admission. Each ticket level provides different benefits such as special access to exclusive networking events as well as reserved seating. Each ticket level includes a year-long membership for the Women Who Embrace Life™ Organization. For more information or to purchase tickets for the Conference, visit https://www.womenwhoembrace.life/.